Longboard Completes - Tons to choose from at Concrete Lines! Get your Dance on. The new Bustin Daenseu 45″ Complete comes as the third edition of Bustins very cool dance/freestyle friendly board. The new PUSH-friendly edition is a leaner, meaner 45-inch update with sexier curves and more function all around. Built with the new new (E)CORE™ construction, the NEW Daenseu is lighter, thinner and stronger than ever with more pop than a karaoke bar. The Bustin Daenseu 45″ Complete comes complete, ready to skate straight out of the box. The fully re-engineered Bustin Maestro Barcelona 37.4″ Complete features a re-designed mould, shape and (E)Core™ construction. An improved Push-Camber design assures rapid rebound as you power through the city, while the new ultra-low, micro-rocker design allows for effortless slides. The Bustin Maestro Barcelona 37.4″ Complete is ready to skate straight out of the box. The Globe Drednaught 36″ Complete is Globe’s first Downhill and Freeride designed board. A perfect shape with a 3D rocker, mellow w concave and a extra kicktail. The trucks fit a full-sized to longboard barrel bushing and the wheels are soft and smooth, but have a perfect shape to take freeriding. Globe is stepping up their game in downhill and freeriding with this setup and the best thing is that is not crazy expensive! Globe Siam Jagged Rose 39.75″ Complete is an awesome Longboard that is perfect for cruising along the footpath to sliding down the local hills. The Globe Siam features free-ride friendly concave designed to lock you in and assist you in your quest to slide while sill being mellow enough to comfortably cruise your local streets. Globe Siam Jagged Rose 39.75″ Complete Longboard comes complete, ready built and ready to skate straight out of the box. 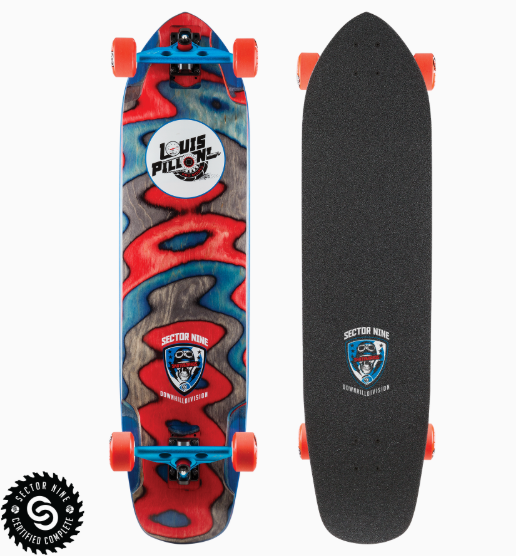 The Globe The All-Time Oil Trip 35.8″ Complete is an awesome longboard that lights-up as you skate! Globe The All-Time Oil Trip 35.8″ Longboard comes complete, ready built and ready to skate straight out of the box. The Globe The Cutler Aloha From Hell 36.5″ Complete is an awesome longboard for every occasion! Globe The Cutler Aloha From Hell longboards are made with a real Canadian/Walnut deck and a flush mounted drop-through style with cutaway wheel wells. Perfect cruising longboard. The Globe The Cutler Aloha From Hell 36.5″ Longboard comes complete, ready built and ready to skate straight out of the box. The Gold Coast Longboards Wanderlust Pink Swirl 38″ Kicktail Complete is an awesome longboard for every occasion! The Gold Coast Longboards Wanderlust Blue Swirl 38″ Complete is an awesome longboard for every occasion! The Gold Coast Longboards Wanderlust Blue Swirl 38″ Kicktail Complete is an awesome longboard for every occasion! 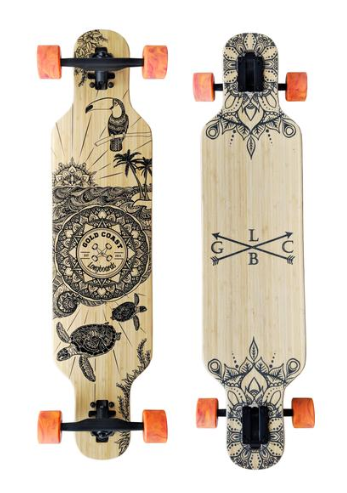 The Gold Coast Longboards Wanderlust Orange Swirl 38″ Complete is an awesome longboard for every occasion! The Gold Coast Longboards Wanderlust Orange Swirl 38″ Kicktail Complete is an awesome longboard for every occasion! The Gold Coast Longboards Wanderlust Pink Swirl 38″ Complete is an awesome longboard for every occasion! 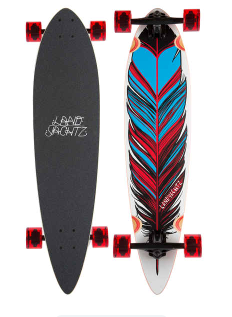 Get in touch with your wild side with our GoldCoast Pluton Drop Through 38″ Complete longboard! The Kahuna Bombora Longboards are probably the funnest, most surfy feeling board on the planet. At just under 5′ long, this 59″ hand painted classic is the The Kahuna Bombora Longboards are probably the funnest, most surfy feeling board on the planet. At just under 5′ long, this 59″ hand painted classic is the ultimate SUP for the land board. Built specifically for everything Land Paddle, Street SUP, and Street Surf related. We don’t put any grip on top of this board. The natural feel of the board is so awesome. You can walk up and down the board with ease. Each Bombora Longboard is hand painted with love. You’ll likely see some small beautiful imperfections because of how we make these vintage boards. The Bomboras are beloved by Kahuna Boardriders worldwide. The Shaka Kahili Longboard pays tribute to the original Hawaiian Flag the Kahili Flag. The invaders of the Islands burned and destroyed the Kahili Flag attempting to destroy the Hawaiian culture and history. The Kahili Flag is BACK! The Shaka Kahili shows off elements of the flag that started it all. Next time you visit Hawaii, pay attention to the Hawaiians proudly displaying the Kahili Flag. It’s time to put on your favorite jam and get familiar with your new dancing partner! The Bamboo Stratus uses a unique construction of Maple, Bamboo and epoxy to provide a springy, surprisingly light, strong, and long lasting board. The symmetrical shape and smooth contours are just a couple features that will help you dance your way to the top; even if you have two left feet. Designed in Vancouver, BC, Canada, this is one of the best boards around for commuting through the city. The Landyachtz Totem Taka Owl features a directional shape for easy steering and maneuverability. The top mount construction gives you full leverage and control over your board for quick movements weaving through the city streets. The Landyachtz Totem Taka Owl is lightweight in design, making it very easy to push this board for hours on end, without any fatigue. Overall, no matter where you’re looking to go, the Landyachtz Totem Taka Owl takes you there with ease. Surf the asphalt on this compact and agile board. The Maple Chief packs a ton of fun into a small manoeuvrable pintail. The camber shape and tight wheelbase make` this board super responsive under your feet. The Maple Chief Floral features a floral designed top deck and clear grip. The OBfive Dark Waters 38″ Longboard is the perfect board for cruising to the shops or down to the beach for a surf! Fresh as Bamboo drop through longboard from OBfive with the extremely popular Em Carey graphic! Check out the funky OBfive Fantasy Island Drop Through 38″ Complete! The OBfive Flomax 38″ Longboard is the perfect board for cruising to the shops or down to the beach for a surf! Fresh as Maple drop through longboard from OBfive with the ultra cool Magma graphic! The OBfive Pastel Plasma 38″ Longboard is here for school holidays! Fresh as Bamboo drop through longboard from OBfive with the ultra cool summer graphic! Feel like your at the beach every time you step on this OBfive White Wash Drop Through 38″ Longboard! This is a reissue of the iconic Bomb Hills Not Countries board, included in the 25 Year Anniversary Limited Edition Series. The deck construction on this classic shape features a unique, multi-colour ply, making each board truly one of a kind! Enjoy this perfect high-speed carving vehicle that also allows you to take control of tough, steep terrain. The Sector 9 25 Year BHNC Black/Natural/Silver Longboard Complete Skateboard – 10″ x 45″ is perfect for bombing hills, carving sidewalks, or just kickin’ around. It comes factory pre-assembled which includes trucks, wheels, bearings, hardware, and grip tape. This Sector 9 Longboard is ready to skate right out of the box! We are proud to bring back a limited run of the original Cosmic 1. This versatile, classic shape is constructed with a fibreglass and maple sandwich, which provides the rider with both flex and control, allowing quick, stylish turns and easy manoeuvrability. The silver foil directly corresponds to our 25 Year Anniversary. Whether you’re planning on taking the Cosmic 1 on a traditional slalom run, an urban sidewalk cruise, or a rip down a mellow hill, we’re confident you’ll feel like you’re celebrating 25 years of skating with the 9-Ball Crew! If you missed getting one back in ’93, here’s your chance to grab a piece of skateboarding history. The Sector 9 25 Year OG Pintail 46″ Complete, was the board that started it all for us, here at Sector 9, and we thought it essential to bring it back as part of our 25 Year Anniversary celebration! If you have the means, we highly recommend picking one up. The outline of the Kingston is much like Bob’s music…..simply timeless. This shape of board will always be relevant here at Sector 9 and we are certain the Kingston will allow you to lay down some timeless carves and maybe even a soul arch or two! We named this board after the capital of Bob’s birthplace, Jamaica, and we’re confident it will cover all your cruising and commuting needs. Add a little sizzle to your ride with the Ripped Louis Pro! This board features a rippled concave in the front, which provides a pocket to lock your feet in and will help you gain confidence in your slides. Stiff, lightweight fiberglass and maple construction allows for easy control, at any speed. The flush truck mounting, micro-drop and kick tail compliment the other board features and ensure you’ll be having fun no matter where the ride takes you. You might wiggle a little bit when you’re dancing to Bob’s music, but you won’t be wiggling when riding the Nesta……..you’ll be CARVING! This board comes with Gullwing Sidewinder II trucks, which provide you with a quick, responsive turning radius that’s unlike anything you’ve ridden before. Our Bamboo/Maple construction will feel amazing under your feet as you navigate diverse terrain and the drop through mounts make the Nesta easier to push and more stable. Seeking good vibes and classic lines? As our best-selling board, the Lookout has been delivering these for quite some time and we just made it even more appealing with the addition of Nate Reifke’s artwork. The complete version comes with 69mm Top Shelf wheels to keep your speed and easily roll over cracks and any stray rocks that get in your way. The drop-thru truck mounts make the board lower, easier to push, and more stable. The bamboo construction keeps the board light, gives it a nice dampening flex, and is a sustainable resource. The Lookout is such a great all-around carving and cruising board (along with being our top-seller), that we decided to make a shorter version that’s a little lighter, and has a tighter turning radius due to our Gullwing Charger trucks. The Slab Mini-Lookout is the result and we’ve once again partnered with artist Erik Abel, as his work translates perfectly to the Sector 9 brand. The Stag Swift draws from the well-known outlines we’ve been bringing to the marketplace for years and this seasons artwork makes it even more desirable! Salty Timbers has captured one of nature’s most prolific scenes on the bottom of our most recent adaptation of the Swift: a beautiful Stag in its natural, majestic environment. While we can’t promise that you’ll be looking this good while skating, we can commit that if you’re looking for a fun, easy-to-ride skateboard that will meet all your carving and commuting needs, this board is a smart choice and comes with a successful track record of putting smiles on the faces of those who ride it. The Sector 9 Bob Marley Small Axe Bamboo Series 32.5″ Sidewinder Complete is a carving machine. It also features an iconic Marley graphic thanks to the dope collaboration between Sector 9 and the Bob Marley family. The sidewinder trucks are super carving and allow for really tight turns and the ability to ‘pump’ this cruiser at super fast speeds! Check this 100% Bamboo board out and keep jamming.